Well, here we are…the last day of 2016. And I’m full steam ahead in the kitchen prepping for weeks of healthy eating and holiday binging detox! 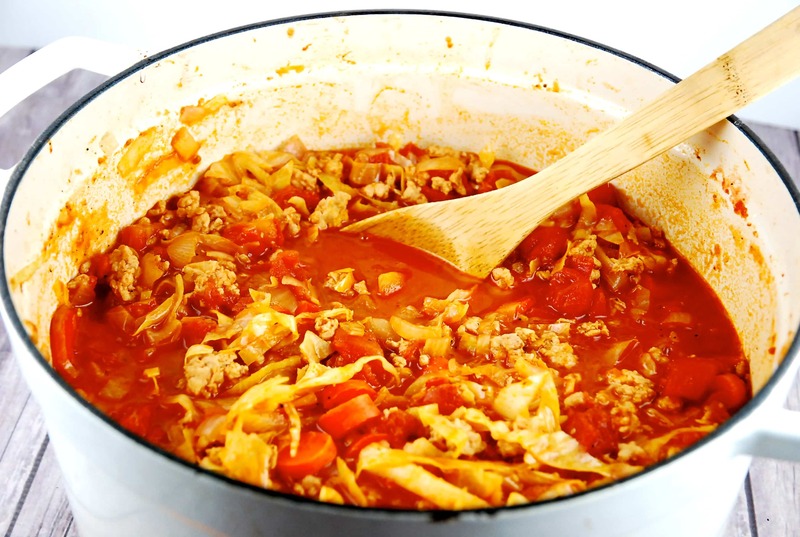 Today’s recipe is one that is a HUGE help to me when I’m trying to cut calories…Stuffed Cabbage Soup. Growing up, my mom would often make stuffed cabbage rolls for dinner. I remember that they were really tasty, but that we didn’t have them often because the recipe required a lot of steps and it was quite time consuming to make. So to get the flavors of traditional stuffed cabbage rolls without all the work, I prefer to make my “lazy mom” version, which basically combines all the ingredients in a soup rather than the rolls. It’s WAY easier, and it tastes wonderful! So bright and fresh, but still hearty and satisfying. I eliminated the rice to save some calories, and I honestly didn’t miss it at all. If you still feel like you need the rice, you could always try Miracle Rice, which is zero calories, so it won’t affect the Smart Points count at all. I actually just made a huge batch of this soup, and am freezing individual portions of it, so I can have it on hand when I’m hungry or hangry (so hungry that I’m angry). It prevents me from eating food that isn’t a part of my healthy eating plan which can derail my progress. If you love stuffed cabbage rolls, I highly recommend this leaner, lighter, soup version instead! Enjoy. And Happy New Year!! A tasty, low carb, low calorie soup that is filling and super easy to make! Bright and a tad tangy, this soup is so flavorful and fresh tasting. Heat oil in a large pot over medium high heat. Add in onions, carrots, and garlic, and sauté for 2 minutes. Add in ground chicken meat, and cook, while using spoon to break up the meat, until the meat is browned and cooked through. Stir in diced tomatoes, tomato paste, chicken broth, Worcestershire, paprika, thyme, and salt and pepper. Bring to a simmer, then add in the cabbage and lemon juice. Allow soup to return to a simmer, then turn heat to low. Cover and cook for about 30 minutes. So delicious! I will definitely include in my Tried It, Loved It Pinterest folder to make again and again. Thanks for a great healthy recipe? I imported this recipe to Fitness PAL and it showed 170 calories a serving. I can’t see any obvious errors. Any ideas? Fitness Pal is most likely including the calories of the vegetables. Since the veggies are 0 Points and do not affect the Smart Points total of the recipe, I leave them out of my nutritional info. This is delicious , I used shredded chicken that was cooked overnite in a slow cooker . I also added some salsa and the juice of one whole lemon . This soup was amazing. The only change that I made was to substitute the ground chicken for 96% fat-free hamburger. Thank you. Omg ?! This is diggity good! My husband loved it and so did I! Added to my favorites! Thanks! You forgot to say when to add the Worcestershire Sauce. I just made this and it is delicious! I was wondering about the nutritional info though…it seems like there would be some great fiber but the listing says zero? This was delicious!! I can see this will become a favorite?? While I enjoy your recipes, I am unable to print them out making them unusable unless I sit here and write them down, which is time consuming. Screen shot them and then email them to yourself to print out later. Voila!